Sunday January 17 1909 I did not go to church but wrote a long letter to Mary Woolf I got our dinners over and went down to Eugene Harts at 3.12 to make a call. I went over home to stay till early bed-time We had a very pleasant evening Rob brought me down to the car. 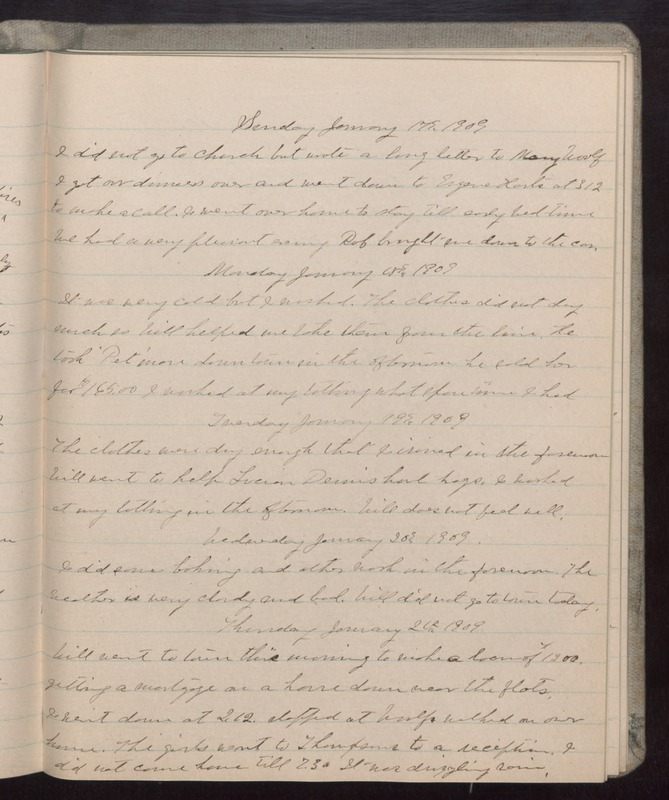 Monday January 18 1909 It was very cold but I washed. The clothes did not dry much so Will helped me take them from the line. He took "Pet" [illegible] down town in the afternoon he sold her for $165.00. I worked at my tatting what spare time I had Tuesday January 19 1909 The clothes were dry enough that I ironed in the forenoon Will went to help Lucian [illegible] haul hogs. I worked at my tatting in the afternoon. Will does not feel well. Wednesday January 20 1909 I did some baking and other work in the forenoon. The weather is very cloudy and bad. Will did not go to town today. Thursday January 21st 1909 Will went to town this morning to make a loan of $1200. getting a mortgage on a house down near the flats. I went down at 2.12. Stopped at Woolfs walked on over home. The girls went to Thompsons to a reception. I did not come home till 2.30 It was drizzling rain.